Most fans of the Calgary Flames probably can’t recall a time when there was no rascally mutt romping around the Saddledome; Harvey the Hound has become as iconic to the Flames organization as the flaming C.
The beloved mascot was created back in 1984 by a couple of local guys who just wanted to see hockey games for free. The rest, they say, is history (or, in this case, “Harv-story”). It wasn’t just the kids of Calgary who took to Harvey, though. All around the NHL, teams who had come to play at the ‘Dome left wanting a mascot of their own and started reaching out to the duo behind the dog. Glenn Street, who had been portraying Harvey during games, recalls these requests were mostly met with bemusement. 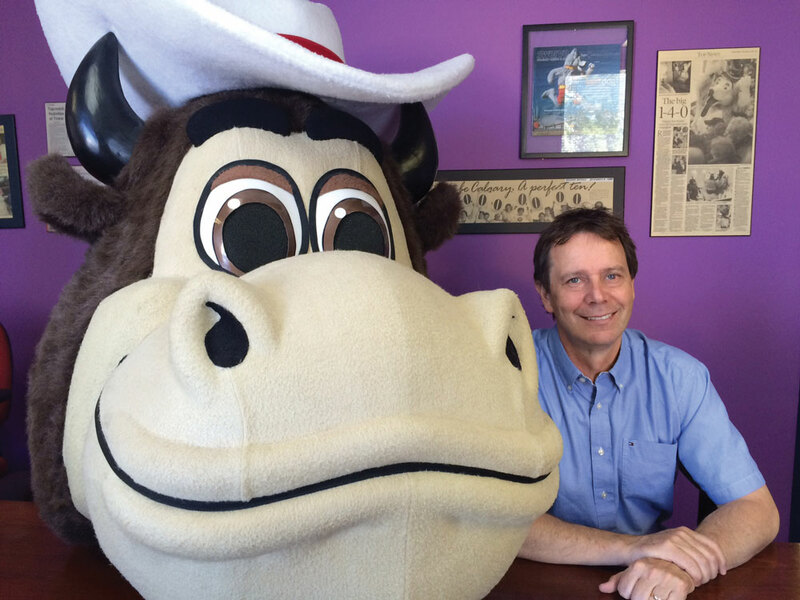 Today, Street would have a hard time convincing you his business isn’t real, as Calgary-based Street Characters has grown into one of the largest mascot-making operations in the world, serving all manner of pro, amateur and college sports organizations, as well as a long list of corporate clients. In the pro-sports arena, its claim to fame is having three mascots in the 2013 Superbowl (the host city, as well as both playing teams). The goal is to claim mascots for the Superbowl-, World Series- and Stanley Cup-winning teams in the same year. “That would be kind of the triple crown for us,” Street says. The mascots created here are definitely an eyeful on the outside, but the success of Street Characters can be attributed to what’s inside. Street’s ace in the hole is his firsthand experience portraying Harvey, one of the reasons, he says, the L.A. Kings chose to work with him, despite that organization being on the doorstep of character-design behemoths like Disney and Universal Studios. Street also draws on his experience to provide professional mascot training. The company sponsors an initiative called Mascots for a Cure, which hosts an annual gathering that usually involves trying to break a Guinness World Record. As part of that gathering, Street Characters presents a conference called Mascot U, which includes instructional sessions.